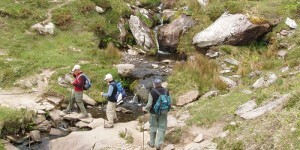 A self-guided (independent) walking holiday on the Dingle Way. 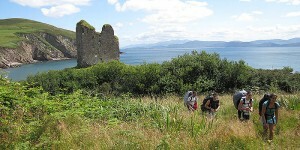 Discover the beauty that is the Dingle Peninsula, by walking the Dingle Way in the south west of Ireland. Walk this circular trail from Tralee town, to the fishing port and bustling town of Dingle and onto the remote areas of Dunquin and Mount Brandon, through one of the last strongholds of the Gaelic language and spectacular scenery, rich in archaeological remains over the spine of the Peninsula and back to Tralee. Embrace the Wild Atlantic Way and enjoy the diversity of landscapes as you pass mountains, corrie lakes and beaches – the setting of many films, including Ryan’s Daughter and Far and Away. Relax and enjoy your walking holiday as we take care of all the arrangements for you. See the full itinerary below for further information. On your arrival in Tralee, make your way to your guesthouse accommodation. If you have an early arrival you can leave your luggage here and visit the town – the capital of Kerry and home of the Rose of Tralee festival. Your welcome pack will be waiting for you at the guesthouse. The first day’s walking is along the lower slopes of the Slieve Mish Mountains, with views over Tralee Bay, past early Christian ruins and pagan sites to the village of Camp. Today you cross the spine of the Dingle Peninsula to traverse above the wildlife sanctuary of Inch beach and then on green road and hilltop to the picturesque village of Annascaul, home to the Antarctic Explorer Tom Crean. – Visit some of Dingle’s pubs, craft shops, tea houses, book shops and famous restaurants. This day’s walking is spectacular, taking you via Ventry Beach and along the slopes of Mount Eagle to Slea Head. This stretch is famous for its concentration of archaeological sites. This is an exciting day’s walk, which takes you high on the line of a military road to a saddle on the Brandon Mountain Range, then down enjoying spectacular views, to the shore of Brandon Bay. Good visibility – or navigating ability – is required. Distance 25km/15.5 miles. Ascent 85m/280ft. Today’s walk takes you back to Tralee, along the northern coast of the Dingle Peninsula, once again partly on beach, with the last stretch along the slopes of the Slieve Mish Mountains. ‘All good things must come to an end’. Enjoy your final hot cooked Irish breakfast and you’re ready to go. Tralee bus and train stations provide several transfer options for you to continue on your journey. Slán abhaile – safe home! 10 nights’ accommodation in family run guesthouses, with private bathroom. 10 hot cooked full Irish breakfasts. Route descriptions and maps and notes by Seán Ó Súilleabháin. Back up of Go Visit Ireland team during your holiday. Single Supplement: €350 for 10 nights will apply. Limited availability. Please note for single travellers: If there is only 1 person on the route at any time there will be an extra luggage transfer charge €120 for the DW10.